The Central African Republic (CAR) has been unstable since its independence from France in 1960 and is one of the least-developed countries in the world. The Central African Republic (CAR) or Centrafrique is a landlocked country in Central Africa. It borders Chad in the north, Sudan in the northeast, South Sudan in the east, the Democratic Republic of the Congo, the Republic of the Congo in the south and Cameroon in the west. The CAR covers a land area of about 620,000 square kilometres (240,000 sq mi) and has an estimated population of about 4.4 million as of 2008. 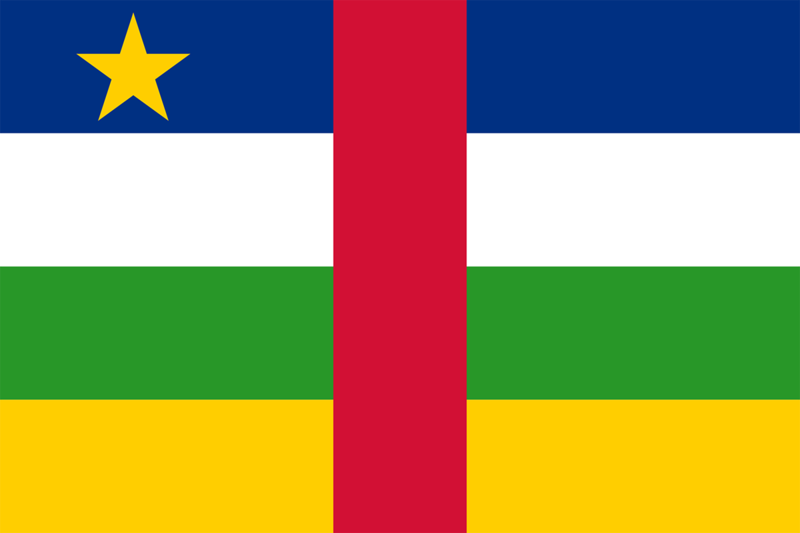 The capital is Bangui. It is rich in diamonds, gold, oil and uranium but has one of the world’s poorest populations. It was plunged into turmoil in 2013 when Muslim rebels from the Seleka umbrella group seized power in the majority Christian country. A band of mostly Christian militias, called the anti-balaka, rose up to counter the Seleka. Seleka handed power to a transitional government in 2014 under international pressure but months of violence followed and the country was effectively partitioned, in spite of the presence of a UN peacekeeping force and a French mission. The country is undergoing an internationally supervised transition involving a constitutional referendum as well as presidential and parliamentary elections. Most of the CAR consists of Sudano-Guinean savannas but it also includes a Sahelo-Sudanian zone in the north and an equatorial forest zone in the south. Two thirds of the country lies in the basins of the Ubangi River, which flows south into the Congo, while the remaining third lies in the basin of the Chari, which flows north into Lake Chad. Despite its significant mineral and other resources, such as uranium reserves in Bakouma, crude oil, gold, diamonds, lumber and hydropower, as well as arable land, the Central African Republic is one of the poorest countries in the world and is among the ten poorest countries in Africa. The Human Development Index for the Central African Republic is 0.343, which puts the country at 179th out of those 187 countries with data. 1880s – France annexes the area, partitions it among commercial concessionaires. 1960 – The Central African Republic becomes independent with David Dacko as president. He turns country into a one-party state. 1965 – Dacko ousted by the army commander, Jean-Bedel Bokassa, who declares himself emperor of the “Central African Empire”. 1979 – Bokassa ousted in a coup backed by French troops. 1981 – Army commander Andre Kolingba seizes power. 1993 – Ange-Felix Patasse wins presidential elections, ending 12 years of military rule. 2003 – Rebel leader and former army commander Francois Bozize seizes power. 2009 – Clashes between government and rebels are ongoing. UN Security Council agrees to creation of UN peace building office for CAR to address ongoing insecurity. 2012 November – New Seleka rebel coalition rapidly overruns north and centre of country, and eventually the capital. 2013 – Turmoil as rival Muslim and Christian fighters are accused of killing hundreds of people. 2014 – Michel Djotodia – coup leader who headed the Seleka coalition – quits as president. Catherine Samba-Panza takes over as interim leader. 2015 – Referendum on constitutional changes in November, followed by first round of presidential election. 2016 – Tension ahead of second round of presidential election, which however, passes off peacefully. Constitutional court had earlier annulled parliamentary election results, citing irregularities.